Indians don’t generally get excited by automatic boxes. We love fuel efficiency and anything that comes in the way is considered the work of Satan. So most traditional autoboxes end up like noise on radar for most car buyers. But Ford hopes to change all that with their Fiesta, which will sport a new six-speed automatic transmission by early next year. Now this isn’t your regular energy-sapping torque converter affair. Ford’s latest slush box isn’t really a slush box, but two manual transmissions in one. It’s something like the famed DSG boxes from Volkswagen. This dry dual clutch gearbox manages its ratios via two computer controlled clutches which preselect gears based on throttle inputs. So while one clutch takes care 1st, 3rd and 5th; the second manages 2nd, 4th,6th and reverse cogs. Ford says the transmission is built for life and doesn’t need extra care unlike regular automatics. You don’t even need to change the oil. They also claim fuel efficiency is almost as good as the manual. Although we couldn’t test for it, we reckon Ford isn’t too off the mark considering the DSG gearboxes are doing well on the efficiency front in cars like the Jetta and Passat. Out on the road, you can tell this isn’t a regular automatic. The shifts are smooth and much quicker than what you might be used to. Ford has also managed to minimise the jerkiness this sort of transmission is known for with clever electronics that monitor clutch engagement ensuring a smooth drive even in stop and go traffic. 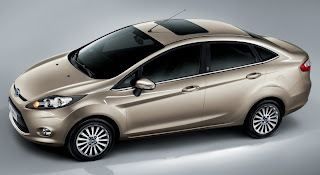 Acceleration is good, but it doesn’t feel as peppy as the Fiesta manual. The ratios seemed to be tuned more for providing better fuel efficiency than outright performance. But if you must drive like a maniac, you might want to slip the shifter into L mode where the transmission selects the lowest possible gear. Useful if you’re driving on the track or down mountain roads. There’s also a hill assist which applies brake pressure for 2.5 seconds even after you take your foot off the brake to keep the car from rolling back. Quite thoughtful. What we didn’t like was the absence of a manual override. Ford doesn’t seem to trust drivers with selecting gears so there’s no additional gate in the shifter for manual cog selection. This perhaps is the only thing wrong with this transmission. For the regular motorist, this will do in most situations, but even average joe may want to have some fun behind the wheel, especially when Fords are known to be driver’s cars. Dynamically, the Fiesta may not be as sharp as the older car, but it still has what it takes to bring a smile on your face. Pity you can’t select gears and ape Michael Schumacher because the Fiesta will play ball when you throw it around. Currently, the Fiesta automatic is available only with the 108bhp petrol. Ford should definitely consider the diesel because that’s what most of us seem to be buying these days. Prices are yet to be announced, and that will be key to the Fiesta’s success because it goes head to head with the likes of the Honda City automatic which has been doing quite well for itself fuel price hike notwithstanding.